Succulent chunks of chicken breast and sautéed onion tossed with pesto. If you grow herbs outdoors in the summer you know how rewarding it can be to step outside, snip off what you want and return triumphant to your kitchen. Fresh, aromatic, delicious, free. (Or nearly free… the cost of a seed packet or starter plant is negligible.) Sometimes you don’t grow enough for your culinary adventures. Other times you have WAY too much. Parsley can be one of the latter, but that's a good thing. 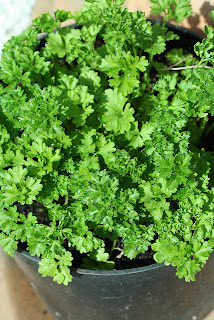 Parsley (Petroselinum hortense) is a native to the central Mediterranean region but is now naturalized in many places in Europe and grown as a biennial or annual all over the world. Parsley needs a fair amount of water, but hates to be wet. It also loves the sun. It is easily grown from seed, although germination can be 4-6 weeks. Parsley really needs no introduction, or does it? Parsley is identified in several “groups” depending on the form of the plant. There are two main divisions: leaf parsley, and root parsley (Yes, parsley grown for its root). Root parsley (Hamburg root parsley) produces a root that looks very much like a parsnip. It is very common in central and eastern Europe. Although very similar to parsnip, the taste is very different. someone says "parsley". This is curly parsley. 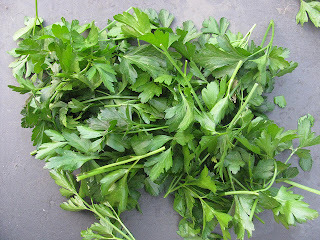 Leaf parsley includes both the curly variety (used as disposable decoration on most restaurant dishes) and the flat leaf variety. Italian parsley (Petroselinum crispum) falls into the flat leaf variety. 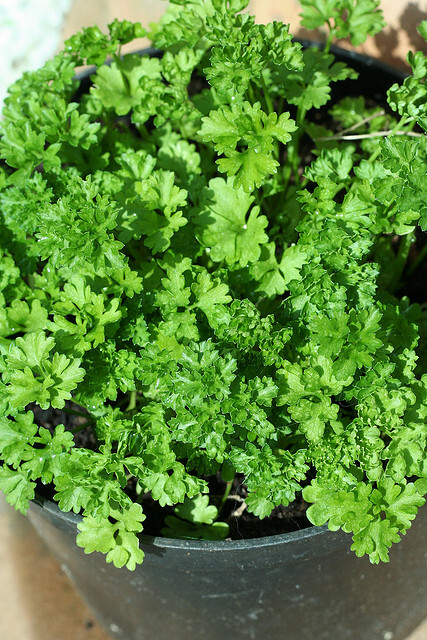 Curly parsley requires more sun and moisture than flat leaf, and flat leaf has a stronger flavour. This makes it a perfect candidate for pesto. Pesto does not – I repeat, does NOT – have to be made with basil. Almost any green, nut and parmesan can be combined to make excellent pesto, although Italian Parsley Pesto is quite common. You should try some combinations and see what you can dream up! 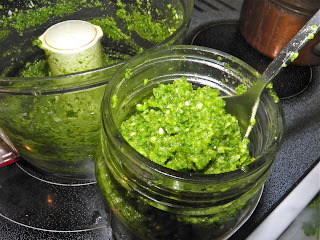 One word of caution, parsley should not be consumed in quantity by pregnant women, so maybe no parsley pesto while you’re preggers. Heat the olive oil in a skillet. 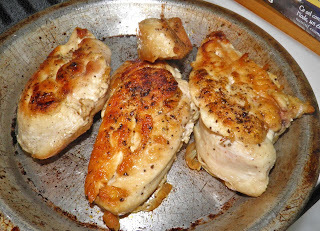 Sear the chicken breasts on both sides. Season with salt and pepper. Add the vermouth to the pan and cover. 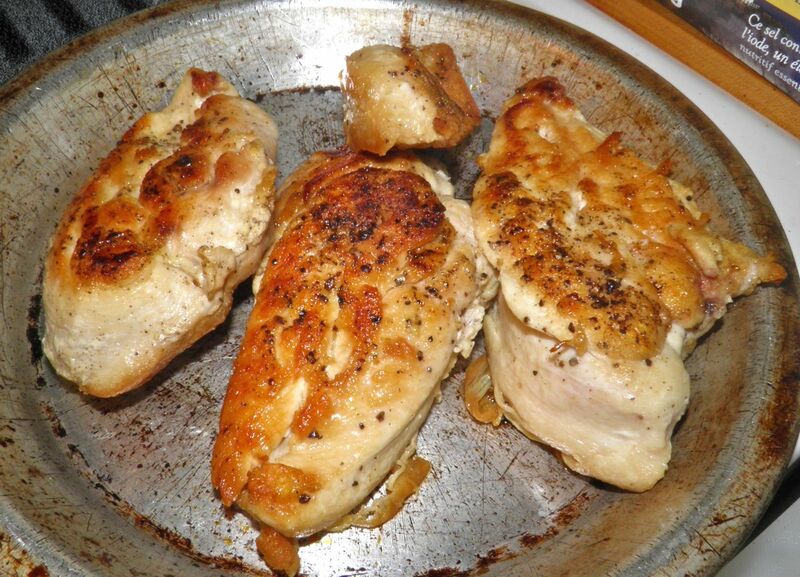 Let the breasts steam for a further 5 minutes. Remove the breasts to a plate. After the chicken is browned begin to cook the pasta. Add the onion to the oil remaining in the pan and cook over medium heat until the begin to brown. Cube the chicken and add to the onion. 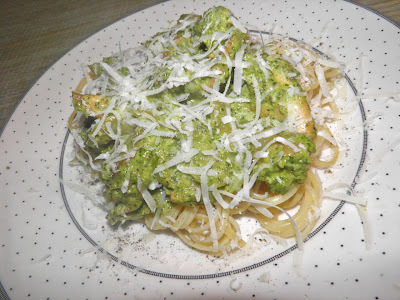 In a bowl, mix the pesto with the cream. Add to the chicken. If too thick, add a ladleful of pasta water to loosen the sauce. Keep warm while the pasta finishes cooking. Serve the sauce over the pasta, sprinkled with freshly grated parmesan. Place the almonds and garlic in a food processor. Pulse until well ground. Chop the parsley and add to the bowl. Process until incorporated. While this is happening, with the motor running, slowly add the olive oil. You are looking for a firm mixture but one that moves easily in the bowl. This may take more than 1/2 cup olive oil. Remove the mixture to a mixing bowl and add the parmesan, salt and pepper. Stir until incorporated. You can add the parmesan in the processor bowl, but I like the consistency of the grated cheese when just stirred in.